1 Blemished Available: $79.96 This item is available as a Blem/Refurb. These are items that cannot be sold as "New" merchandise and are limited to stock on hand. See the product details for a description of the product's condition. The Alpinestars Celer V2 Gloves are made out of full-grain goat leather with strategically perforated panels on the back of the hand to promote air flow. Short cuff styling makes it easy to slip on and take off. Padding on the palm and hard knuckle protection help to dispel impact energy. 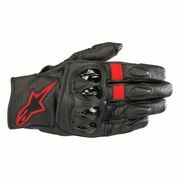 Alpinestars 3rd/4th finger bridge technology helps to safeguard your hand in a lowside crash. The Alpinestars Celer V2 Gloves pack a long list of features into a short cuff glove. Can some one confirm whether or not this glove's insertion opening is bigger than its previous model? The opening, even after separating the velcro, will not allow me to put my hand in into the glove as it is too small to fit over my hand. Off and on very easy. Does the Celer v2 glove have touchscreen compatibility on both the index finger and thumb tips as described in the features or Anthony says in the video only on the index finger? Can someone confirm and correct this? Anthony is right. V2 is touchscreen-friendly on the index finger only on both the hands. Thumb is not touchscreen-friendly. This glove only has one touchscreen-capable finger: index. Thumb is not touchscreen-enabled. I’m pretty sure it’s only in your pointer finger. It is just on the two index fingers. It is on the tip of the finger. The fingerprint area is not touch screen compatiable.